Experienced managers, directors and leaders understand that to maximize profits and succeed in business you need a successful, happy and communicative team behind you. Team building is essential to staff in the workplace and this has never been more apparent than in today’s turbulent financial times. Ice breaker games can create strong bonds between staff, spark successful working partnerships and create a happy workplace atmosphere. When planning a meeting or team building activity you should try and begin with an ice breaker game, as this will encourage staff interaction and a unity in the group before proceeding with a meeting or task. Companies today are finding staff changes a lot more frequent than they used to be with bosses introducing new employees more often. This obviously makes it difficult for the company to stay united, which is why it is vital to make new employees comfortable and acquainted with fellow colleagues. An ice breaker is a sure fire solution to this common problem and helps build the team and encourage teamwork in the workplace. A sense of camaraderie is achieved when employees feel they have accomplished something in the workplace. This is even truer if the process was interesting and fun. For instance, if you have an important meeting involving long speeches or analysis of last year’s figures, you should consider the possibility your attendees may lack interest and loose focus. To counteract this, play a short game before the meeting to stimulate their minds and increase concentration. Make sure the game is short, simple and most importantly interactive. 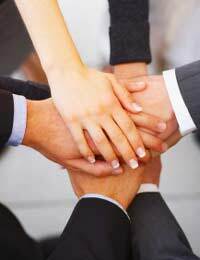 The group needs to work together for you and your colleagues to benefit from the game. As a quick team building activity before a meeting, layout out something that the team can build. This can be anything from children’s builders’ blocks to tape and matches. Ask the team to construct something relating to the meeting you are about to have. This alleviates any sense of boredom throughout the meeting, encourages interaction within the team and gives everyone a nice surprise. When everyone enters the workplace for a meeting get each member of the team to enter the hot seat. Who ever is in the hot seat must answer a string of questions from the rest of the team. These questions can involve work but to make the game more interesting you should throw in a few non-works related questions to relax the group and make the whole ice breaker more enjoyable. You could ask ‘how many pies they ate at the Christmas party?’ or ‘what they think of a colleague?’ Any question that gets the team laughing and enjoying themselves is a bonus. This breaks the ice for new employees and helps everyone find out a little more about each other. Have each team member write down a task they carry out in their position. Then put all the pieces of paper with the tasks on in a container of some kind (a hat or box will do) then have each person pick out a task and guess who carries out that task and what their position in the company is. This game helps employees understand who does what and helps new comers get an idea of who’s who.